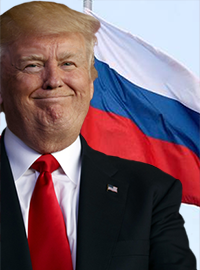 President Trump has announced a new design for U.S.A. flag which resembles the design of the Russia flag. Shortly after the press conference several Democrats pointed out that Trump’s flag design is identical to the design of the Russia flag. Trump said he was inspired to change the flag after seeing other world leaders, specifically Vladimir Putin and Kim Jong-un, standing in front of their country’s flag. Current White House Chief of Staff, Mick Mulvaney, walked back Trump’s comments about changing the flag saying Trump was speaking hypothetically and metaphorically. When asked about Trump’s comments regarding the flag, Republican senators both rejected and supported Trump’s design idea. “The President’s idea to redesign our flag is reprehensible and I cannot support that but the flag is old and the President’s design is a very good one,” said Senator Lindsey Graham.